Crown Royal is the largest and most popular brand of Canadian Whisky in the world. The Crown Royal Distillery is located on the banks of Lake Winnipeg in Gimli, Manitoba, Canada and produces 20 brands, labels and variations of Canadian Whisky. Crown Royal is owned by beverage/spirit giant Diagao, since 2000 which is headquartered in London, England. Almost eighty years ago just prior to the outbreak of World War II in 1939, the royal Monarchs of the Commonwealth of Nations and the British Empire decided to be the first members of a sitting Royal Family to ever visit their subsidiary of Canada. It was King George VI and Queen Elizabeth I that started their voyage to Canada aboard the brand new Luxury Ocean Liner, the Queen Mary. Upon arriving in Newfoundland they boarded the Canadian Pacific Railroad and toured the second largest country on earth from one end in the east along the Atlantic Ocean to the other end in the west along the Pacific Ocean. The people of Canada were in a euphoric state hearing the news of the Royal visit including an up and comping whisky entrepreneur named Samuel Bronfman. At his plant in Waterloo, Ontario, Canada, Bronfman and a few of his assistants set out to blend the finest whisky on earth, "One Worthy of the King." Between them they experimented with hundreds and hundreds of outcome recipes after requesting dozens and dozens of different whiskies from every distillery that would include theirs from every corner of Canada. When the process was complete they commissioned 120 cut-glass decanters and fashioned them with handmade crown fitted tops. They also packaged each bottle in a royal purple velvet bag with yellow stitching and yellow drawstring tie. The result of that process was a heavenly spirit that had a mixture of over 50 different distilled grain whiskies blended into a masterpiece. The whisky that Bronfman presented to the King and Queen was exquisitely smooth and became known from that point on, as Crown Royal. The ten cases of the Royal Whisky was given its own railroad coach car for traveling on this cross-country tour, then tall stories of this whisky "fit for a King" spread like wildfire across the continent in Canada and the United States. Bronfman would go on to be named the President of Seagram's Company, Ltd. Crown Royal was only available in Canada for the first 25 years of its existence. In 1964 the powers that be at Crown Royal relented and made it available in the United States for the first time. In 1992 after 53 years of only having one brand, the distillery and Master Blender launched Crown Royal Reserve, aging the whiskies for longer periods of time and hand selecting the barrels to be used in the blend. Reserve comes in a taller more slender bottle than the typical brand and it is packaged in a tan velvet-like bag with course dark gold drawstrings. In 2000, spirit conglomerate Diageo purchased Crown Royal and in 2002 the sale of Crown Royal surpassed that of Canadian Club and has been the top selling Canadian Whisky in the world ever since. Today Crown Royal has over a 35% market share and more than doubles its next closest rival. Crown Royal XR Red (Extra Rare) was introduced in 2006. This very limited-release version is the most expensive Crown Royal brand sold to date. Each bottle is numbered and registered for authentication purposes. This extra rare blend was made from the very last batches of whiskey distilled at the defunct Waterloo, Ontario, distillery. The version is sold in a heavy-duty presentation box (not cardboard) that will last for years with a yellow pillow stand and an extra large dark red velvet bag heavy gold drawstrings. In later years after 2012, a newer Crown Royal XR Blue featured whiskies from the now-closed Lasalle, Quebec, distillery. The LaSalle-based Crown Royal XR features a blue color schemed box and bag to distinguish it from the red color scheme of the original Waterloo-based version. In 2010, Crown Royal release its Crown Royal Black brand, one that has a higher corn content, a higher 90 proof and packaged in a black velvet-like bag with gold metallic accents and drawstrings. This version became a huge success on the liquor store shelves and in the whisky reviews. Not to leave Canadians out in the cold, Canadians once again had their own exclusive Crown Royal, unavailable anywhere else in the world. That's when Crown released Crown Royal Limited Edition in 2010. It was the first time since 1964 that Canadians could enjoy their very own exclusive version of Crown Royal. In November 2012, Crown released it very first flavored whisky after the Canadian Government relaxed some rules with a new law passed on July 1, 2009. The very first flavor was Crown Royal Maple and the product was described in Canada as a "Maple Flavored Whisky Beverage" produced by adding natural maple flavoring and finished in maple toasted oak. According to the distillery, the staves and oak chips have been especially toasted using a proprietary process to bring out their natural maple flavor and aroma characteristics. Maple is packaged in a brown velvet-like bag with yellow drawstrings and stitching. 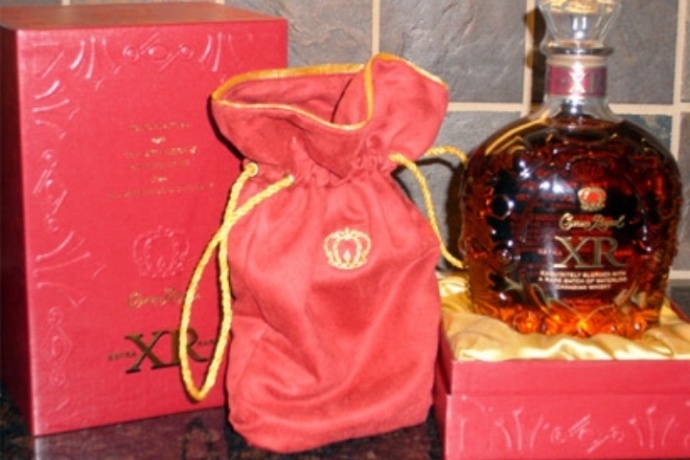 In order to carry on their high-end Crown based brands, Diageo introduced Crown Royal XO in January 2014. It is a blend of 50 whiskies that is then later finished for six to nine months in Cognac casks made from French Limousin oak. It is packaged in a gray velvet-like bag with yellow embroidery accents and drawstrings. In November 2014, Crown Royal release its Crown Royal Regal Apple brand, one that is a unique blend of Crown Royal whiskies and Regal Gala apples resulting in the perfect balance of robust whiskey notes and crisp apple flavor bottled at 70 proof. It is packaged in a green velvet-like bag with yellow accents and drawstrings. Crown Royal Vanilla was launched in November 2016, this whisky is made by infusing Crown Royal whisky with a concentrated flavoring agent made from Madagascar Bourbon vanilla, widely considered the world’s most flavorful vanilla and bottled at 70 proof. It is packaged in a gray velvet-like bag with gold accents and drawstrings.